Onions. Infernal onions. I cook with them almost daily as they’re an intrinsic part of how I cook, and each time – each and every time – they manage to draw at least one tear out of me. The Mothership always advised that before I actually begin cutting my onions for inclusion in a dish I peel my onion and then cut it in half, then quickly run it under cold water, and to some extent this has worked, but I still feel the sting of collecting tears. And of course the main thing to remember above all else is never NEVER rub your eyes as you will enter a world of pain from which there is no escape. It was sometimes a lot worse when I wore contact lenses as I stupidly presumed that they would act as superhero goggles and protect me, but as I’m one of those people who invariably rub their eyes at the most inappropriate times I don’t think there are many awkward experiences that can compare to having the evil onion trapped directly on top of your eyes by a layer of plastic. Why do onions hate us so? It turns out that the plant group that onions belong to, mingling at family reunions with relatives like garlic, chives and leeks, absorbs sulphur from the soil they grow in, which in turn builds up inside the onions cells. When we cut an onion open we allow oxygen to interact with the cells, which triggers a chemical reaction that produces a stinging sulphur gas. This gas reacts with the water in your eyes to form sulphuric acid, which is what causes the pain that we feel. If you reach up to rub your eyes there’s a chance your fingers are directly carrying some of the onions cells, which will make the problem oh so much worse..
Cut the onion under running water. Freeze the onion for a few minutes before cutting. Cook it before you cut it. If the onion’s small enough, don’t cut it but boil instead. Allegedly gripping a slice of lemon, a sugar cube or a piece of bread between your teeth works as the food absorbs the gas before it reaches your eyes. Use a very sharp knife to cut your onion as it supposedly reduces cell damage, minimising the sulphur gas released. Put a metal spoon in the freezer, then take out and hold in your mouth while you’re chopping the onions. Chew gum while you’re cutting your onion. This last one, the swimming goggles, seems like a good idea as you completely protect your eyes and can easily buy a cheap pair of goggles from a Pound Shop (Dollar Store for you, my American brethren), which is why I was amazed to find that a company called RSVP International Inc based out of Seattle are selling via Amazon (although I’m sure other discerning distributors are available) Onion Goggles from $19.95 to $23.50 (free shipping if you order over $25 w orth of stuff, otherwise it’s $5.58 for shipping). I think it’s absolutely amazing that a company actually sells fancy swimming goggles for more than $19 when I can simply go to my local Dollar Tree/Dollar Store/Dollar General/Family Dollar and get enough pairs of cheap swimming goggles to last me the next 10-years for a total of $5. 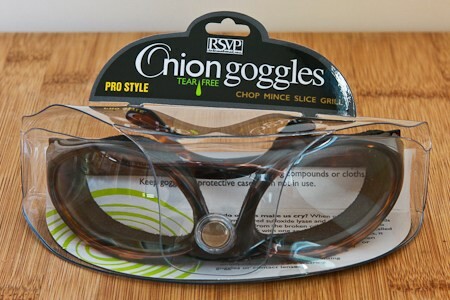 It just goes to show that there are some people with more money than sense, otherwise RSVP International wouldn’t be marking up their plastic swimming goggles…whoops sorry, I mean their incredibly well researched and unique onion goggles…so ridiculously high. I end this post with a link to an adorable song from American singer/songwriter Meiko (AKA Meiko Sheppard) called You and Onions Make Me Cry. Hahahaha this is hilarious! 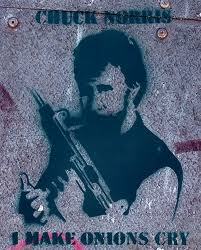 Cheers to the works of a closet ninja.